Titus County is a county located in the northeastern region of the U.S. state of Texas. As of the 2010 census, its population was 32,334. Its county seat is Mount Pleasant. The county is named for Andrew Jackson Titus, an early settler. Titus County comprises the Mount Pleasant, TX Micropolitan Statistical Area. According to the U.S. Census Bureau, the county has a total area of 426 square miles (1,100 km2), of which 406 square miles (1,050 km2) is land and 20 square miles (52 km2) (4.6%) is water. As of the census of 2000, there were 28,118 people, 9,552 households, and 7,154 families residing in the county. The population density was 68 people per square mile (26/km²). There were 10,675 housing units at an average density of 26 per square mile (10/km²). The racial makeup of the county was 88.8% White, 10.10% Black or African American, 1.10% other. 40.6% of the population were Hispanic or Latino of any race. There were 9,552 households out of which 39.10% had children under the age of 18 living with them, 59.00% were married couples living together, 11.40% had a female householder with no husband present, and 25.10% were non-families. 22.10% of all households were made up of individuals and 11.10% had someone living alone who was 65 years of age or older. The average household size was 2.88 and the average family size was 3.36. In the county, the population was spread out with 30.30% under the age of 18, 9.80% from 18 to 24, 28.00% from 25 to 44, 19.50% from 45 to 64, and 12.50% who were 65 years of age or older. The median age was 32 years. For every 100 females there were 97.80 males. For every 100 females age 18 and over, there were 94.00 males. The median income for a household in the county was $32,452, and the median income for a family was $37,390. Males had a median income of $26,466 versus $18,238 for females. The per capita income for the county was $15,501. About 14.90% of families and 18.50% of the population were below the poverty line, including 25.10% of those under age 18 and 14.10% of those age 65 or over. 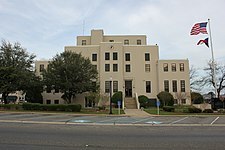 Titus County was formerly represented in the Texas State Senate by Bill Ratliff, a Republican politician who served from 2001-2003 as Lieutenant Governor of Texas. Prior to 2000, Titus County was mostly dominated by the Democratic Party at the presidential level, only voting for Republican candidates before then in the midst of 49-state landslides in 1972 & 1984. From 2000 on, it has become solidly Republican at the presidential level along with the rest of East Texas. In addition, Northeast Texas Community College serves Titus County, as well as neighboring Morris and Camp counties.